Well-designed dentures that fit securely and look natural benefit the appearance and health of our patients. Providing dentures for Gambrills patients is a rewarding aspect of practice for Dr. Vickii Bingham-Lester. Her personalized process takes a little time, but it is worth the extra effort. Partial denture – A partial is a removable denture that fits around existing dentition. Flexible Valplast® is popular for its comfortable fit. Full denture – A full denture is a complete set of upper or lower teeth. Transitional denture – This is a temporary partial denture. Additional teeth can be added to it if more of your teeth are lost over time. Are you unsatisfied with the dentures you have now, or considering getting dentures.? Immediate denture – You can go home with a full set of teeth on the day of your extractions. Immediate dentures can be re-lined to maintain fit, after healing is completed. 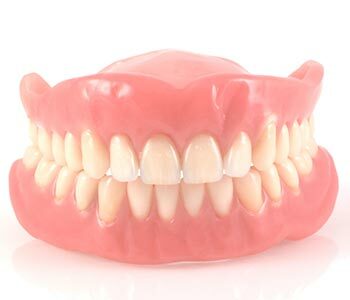 Combination dentures – A customized combination of techniques, such as Valplast® in front for aesthetics, and some metal in the back for stability, may be best. Implant-supported dentures – A few dental implants can hold a denture. Implants also allow for a lighter denture with greater stability. Once your new smile is in place, the Bingham-Lester Dentistry team shows you how to care for your dentures and adjust to wearing them. If you are unsatisfied with the dentures you have now, or are considering getting dentures, please call us today to schedule a consultation. For full or partial dentures in Gambrills, MD, 21054 quality conscious patients choose Dr. Bingham-Lester. The number is 410-885-6522. Tyra M "The staff at Bingham-Lester dentistry are very nice and professional. The office setting is very comforting and relaxing. I have never had such a positive dental experience as I receive EACH time I have an appointment. I really love this place!!!!!!"